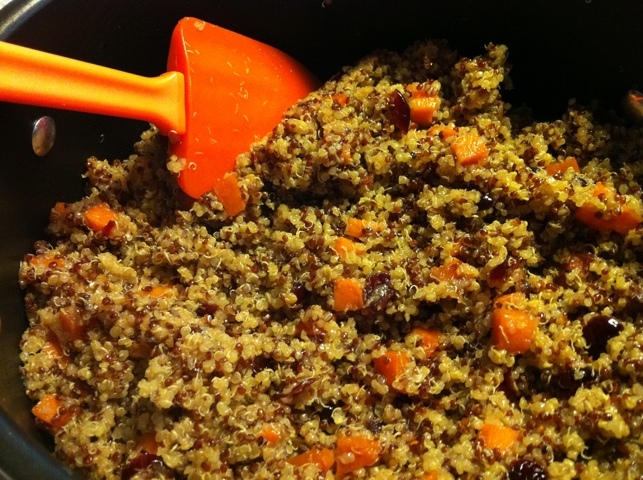 This creation was part of all my holiday cooking, and turned many of my red-neck family into quinoa lovers! Cook quinoa in vegetable or chicken stock, in rice cooker. In separate pot, sauté sweet potatoes & cranberries in olive oil & vinegar until liquids are reduced and sweet potatoes are soft. Season with salt and pepper. Add cooked quinoa to skillet. Stir. Mix in pepitas (or their equivalent) at the end. Make ahead of time to let flavors mingle, serve room temperature or warm – you can even top with gravy! are you blogging any more? Hmmm…I’ve got a couple of posts in my head. I’ve gone paleo, so things around here are going to have to change, anyway!